We all want more sales. And, whilst we’d prefer them to come to us rather than chasing them, we recognise that, in most cases, we have to expend some effort to unearth opportunities. 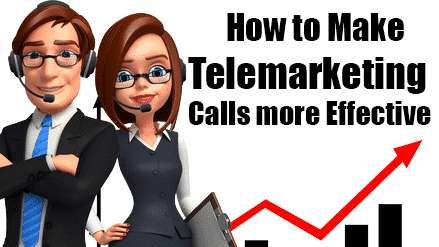 That’s why telemarketing persists as a route to market. It isn’t the only one of course. There are many outbound marketing channels that you can use in tandem with telemarketing or in place of calling. But, if you are using the telephone as a lead generation method, you need to make sure you use it wisely. This isn’t the first time I’ve written about effective cold calling techniques. Check out some of the following. 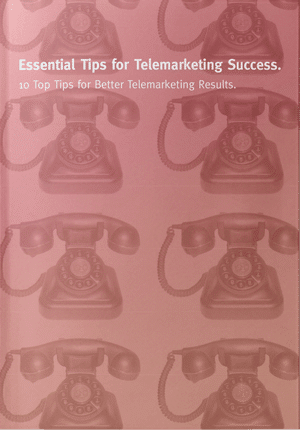 Below are our 10 quick tips for making your telemarketing calls more effective. Sounds simple? In many ways it is. But, at all levels of the above, telemarketers and the companies that employ them, get it wrong. They fail to define a market that would be genuinely receptive to their products or services. Or, they go after unrealistic targets that are, for one reason or another, totally out of reach. They use old and inaccurate data that’s destined to produce poor results. Wrong numbers, wrong people, and wrong decision maker roles significantly impair the likely success of a telemarketing campaign. They haven’t genuinely worked out the ‘why’. Why would a time poor decision maker want to (1) take the call (2) give you more than a few seconds of their time (3) buy from you or agree to meet you? Bland messages don’t work. The prospect wants to feel special. He or she wants to feel that you’ve thought about them and what you say pertains directly to their challenges or opportunities. What’s your call to action? This is a hard one. If you sell widgets and they have enough widgets, maybe they won’t jump up and down. But, try to give them a reason to do something even if it’s to receive something in the post or an email pdf. Oh those poor intros. And, I’m not talking about poor stiff and stilted calls from India. Too often, intros all sound alike. They telegraph that you’re a cold caller. How can you make your intro sound natural and engaging that encourages the prospect to stay on the line? Boring people get nowhere. I know it’s a hard job. But the decision maker doesn’t know you’ve been doing this for days with no result and doesn’t care. Every call needs to sound fresh. Energy is crucial or the call won’t last long. Sales people won’t be successful if they only focus on their pitch when they should be demonstrating interest. Assuming that you’ve got the points above right, remember that most people don’t want to hear about you. They want to talk about themselves and stuff that interests them. The way to achieve the above is to ask relevant and effective questions and to listen attentively to the answers. A blend of open and closed questions works best or it’ll sound like an inquisition. Chatting is nice but what’s your objective? Never forget that you’re trying to build the sales pipeline. Some opportunities will be immediate. Some outcomes may be part of the sales process e.g a meeting, demo, attendance at an event, receiving a white paper etc. Whatever the outcome, don’t forget your objective and ask for it. Telemarketing is a numbers games. Whilst I believe that this is true, since not every prospect is ready at the point of contact, your approach counts for a lot. It will be the difference between success and failure so check out the points about and see how you measure up regarding how to make telemarketing calls more effective. This is great list of Lead generation services Blog, i am Reading regular bases regarding Lead generation services. I’m impressed, I must say. Seldom do I come across a blog that’s both educative and amusing, and without a doubt, you’ve hit the nail on the head. The issue is something not enough men and women are speaking intelligently about. Now i’m very happy I came across this in my hunt for something regarding this. Are You a Driver or Passenger in Your Business?